… the Nave of the Sterling Memorial Library at Yale. 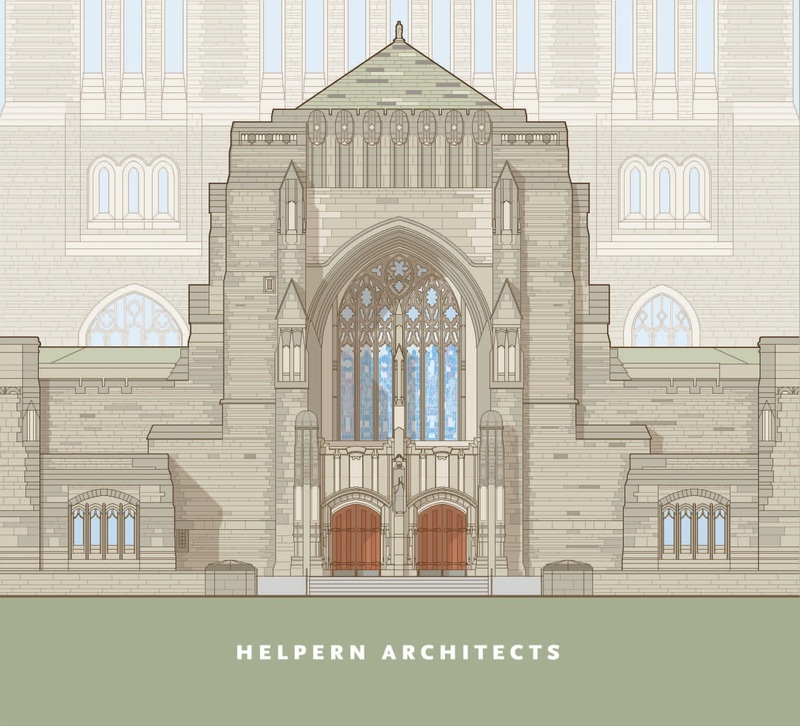 This year, we proudly announce that the Helpern project depicted on the 2013 card is the splendid Nave at Yale’s Sterling Memorial Library. “Usually we repeat the façade on both sides of the card, but the extensive and exciting interior renovation is the main part of the project, and so we have shown both,” explained David Helpern, FAIA. The 6¾ by 5¾ card, rendered in the accurate tones of granite, limestone, sandstone, and oak over a soft green base, depicts both the main High Street façade and also the interior of the main entry to the New Haven campus’ iconic structure. Since 1998, Helpern Architects has renovated six fine 19th- and early 20th-century buildings at Yale University. In 2003, the elegant Skinner-Trowbridge Mansion, which Helpern Architects converted into the International Center for Finance for the Yale School of Management was the featured project. Helpern’s assignment to restore and renovate the Nave began in 2011 after winning over a field of outstanding preservation-oriented competing firms. Yale’s new University Librarian Susan Gibbons has been directly involved, and the University’s Office of Facilities staff is managing the work. The extensive renovation will continue through most of 2014. Already largely scaffolded, the Nave has never been closed during library hours. The Nave is the 32nd card in a collection that includes low-rise and high-rise buildings for commercial and institutional clients, new buildings and renovations alike, including historic or landmarked structures. Sterling Memorial Library is very much a functioning research library – in fact, one of the world’s largest – unlike Columbia University’s Low Memorial Library, whose 2001 card honored the restoration of that colossal double dome and parts of the building. However, Low is now Columbia’s administrative center. For almost three decades, the cards – always based on Helpern elevation drawings – have been designed by Whitehouse & Company.